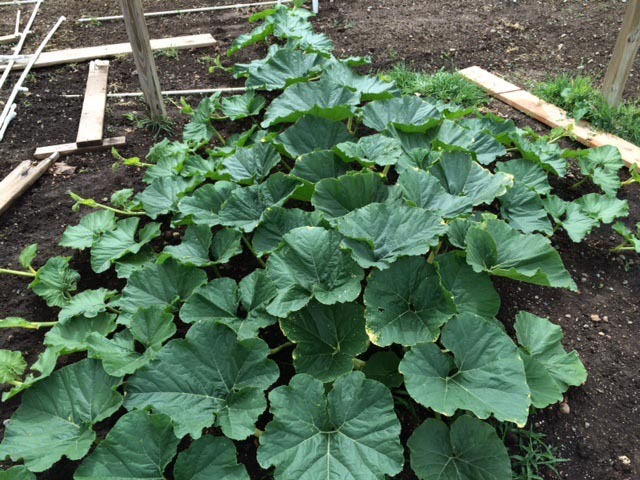 This is the 282 Scherber pumpkin plant. It is a seed from a selfed clone of the 1725 that grew the world record 2009. It is the "other" seed from the world record plant. I'd like to prove it is the better seed of the two. Although this plant is a week younger than the 1985 Miller it seems to be just as good a plant. It is missing the first side vine on the right hand side. If I hadn't already picked out the names for this year's pumpkin I would have named it Lefty. I haven't measured the length of either plant lately but I would guess that both plants are about within a foot of each other in length right now. Probably about 15-16' long at this point. The 282 isn't quite as wide as the 1985 however. Hey Jamie, I was wondering if you could do a post on your methodology for which plants you will self polinate, and which plants you will cross polinate. I have a 924 Johnson an 820 Johnson and a 401 Johnson all growing. I'm coming up on pollination time and wondering what I should do. Would love some advice.